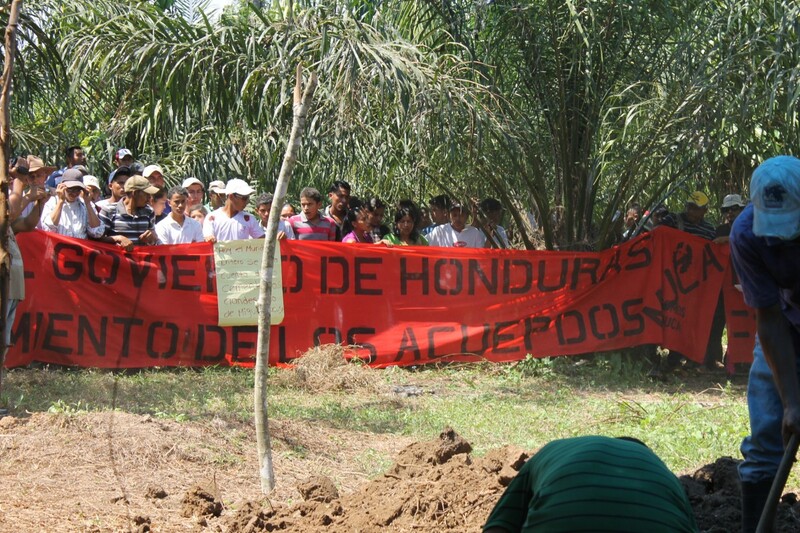 From April 23- 26 2013, the Honduras Accompaniment Project (PROAH) accompanied members of the Committee of the Families of the Detained and Disappeared in Honduras (COFADEH) to the lower Aguán, where they exhumed a human skeleton that was found by campesinos in the Paso Aguán property, near the Panamá community. 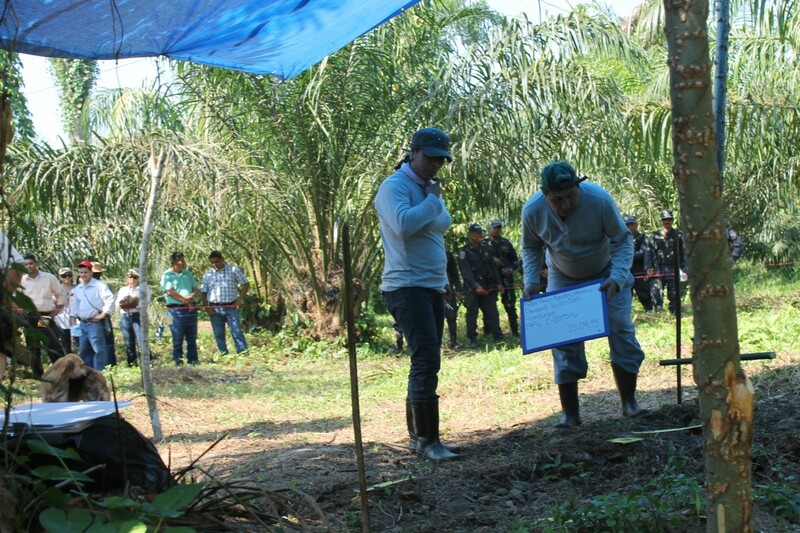 The COFADEH, at the request of the community and the family of José Antonio Lopez Lara, who disappeared on April 29, 2012 on the Paso Aguán property, asked experts from the Forensic Anthropology Foundation of Guatemala (FAFG) to conduct the exhumation with the authorization of the judicial authorities of Trujillo, department of Colón, and with the support of the Human Rights Office of Honduras. The embrace of Doña Elena is strong and warm. Her slender and agile body does not show her 79 years; her direct, sharp gaze is that of a woman who, although she has suffered her whole life, including the greatest pain of losing a child, cannot give up and continues struggling for justice. 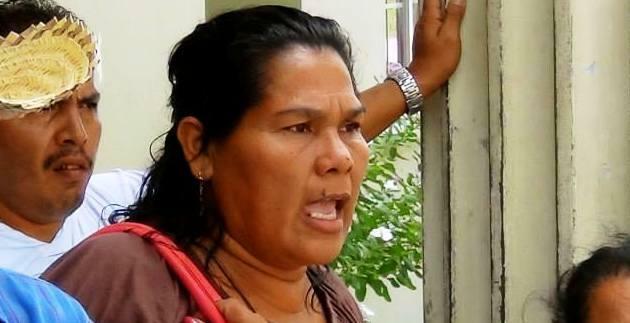 The anguish of Doña Elena and her family began a year ago, when José Antonio López Lara, a 46 year old campesino, disappeared on April 29, 2012. He left his house in the Rigores community (Trujillo, Colón) to fish in the Ilanga river, whose waters border the Paso Aguán palm oil estate, then in the hands of landowner Miguel Facussé Barjum. According to Saudi, the oldest daughter of José Antonio, Facussé’s guards had previously threatened to disappear and kill her father for approaching the estate. 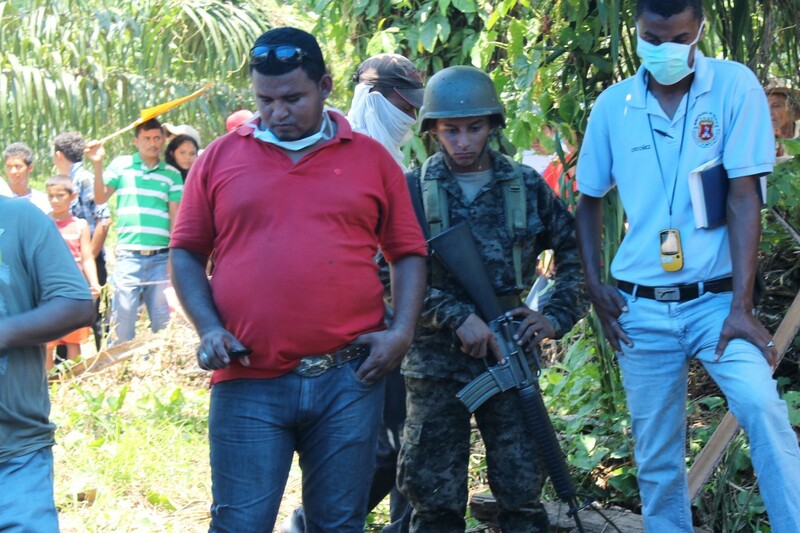 On the day of his disappearance, “around 10 am, some campesinos from there said that they heard 4 shots”1. However, nothing was known about José Antonio until April 3, 2013, when a human skeleton was found buried in a clandestine grave on the Paso Aguán property that borders the Panamá community. The discovery of the grave, about 200 meters from the place where Jose Antonio was supposedly fishing, suggested that they might be his remains. Before José Antonio López Lara, at least three campesinos have been reported disappeared. On May 15, 2011, Francisco Pascual López (37 years old) disappeared while herding cattle. A boy heard shots, but the body was not found. Meanwhile Antonio Gómez (55 years old), a member of the Nueva Vida de Rigores movement and campesino from the Panamá plantation, disappeared in February 2012 and the Panamá plantation guard, Lito Rivera (35 years old) disappeared on his way to work on the afternoon of January 30, 2012. The guards and owners of the property always prevented the families and friends of the disappeared from looking for the bodies that would allow them to ascertain the truth. It was after the disappearance of the campesino leader Gregorio Chávez on July 2, 2012, whose lifeless body was found three days later in the Paso Aguán estate and after the retaking of the property by the campesinos that a commission was formed to search for the rest of the victims and, after three false alarms, on April 3, 2013 another body was found2. 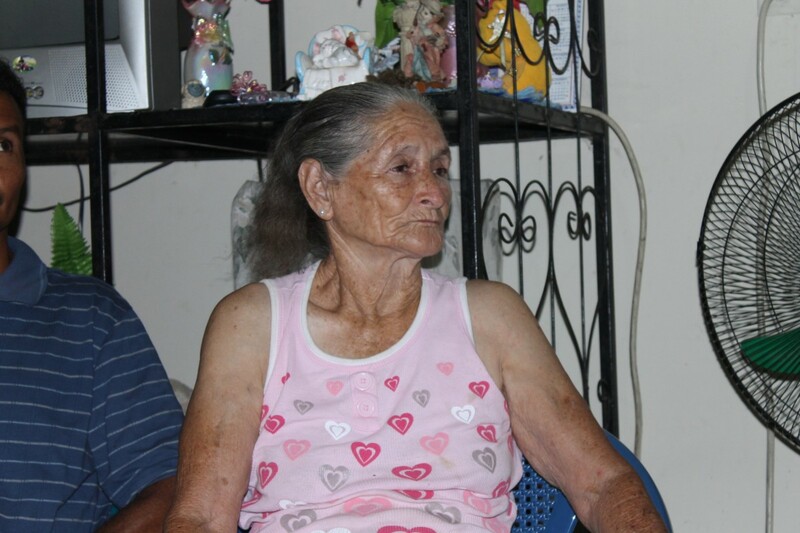 Although José Antonio López Lara’s family immediately went to the police station to report the illegal grave, suspecting that it might have to do with their relative, the police did not follow up on the report. So while José Antonio was not part of any campesino movements in the area, the Unified Campesino Movement of Aguán (MUCA) and other organizations decided not to ignore the fact and organized for the official exhumation and identification of the remains. First, they approached the area and decided to take shifts in groups of 10 during the day and 50 men at night so that nobody could erase the traces of one or possibly more of the victims of violent land conflict that is ongoing in the region. After that they began the formal process to be able to proceed with the exhumation. First, the petition was presented to the Trujillo court by the Special Prosecutor of Human Rights, COFADEH, the families of the disappeared in the Lower Aguán and the MUCA. Then the Trujillo court took care of finalizing the process. The exhumation was conducted on April 25th. 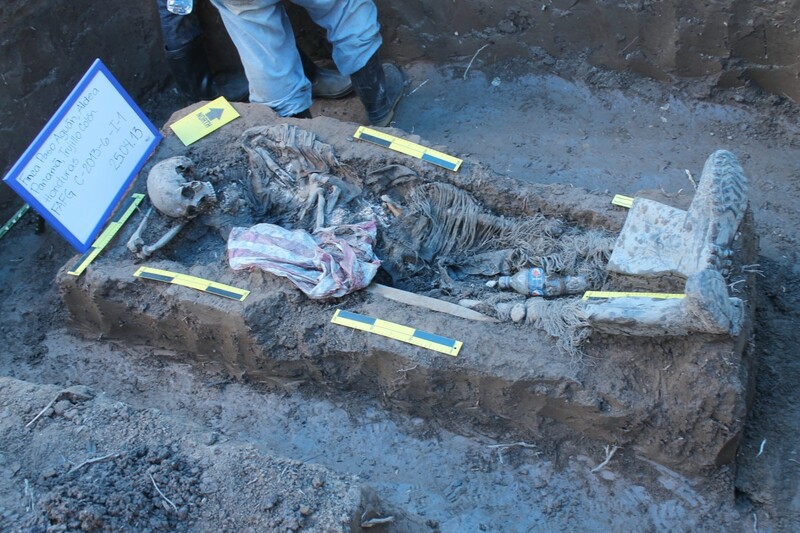 The process was carried out by experts from the Forensic Anthropology Foundation of Guatemala (FAFG), the archeologist Leonel Paíz, and the Anthropologist Alma Vázquez. When, at dawn, the experts from Guatemala arrived to the site of the discovery with members of the COFADEH, international observers and journalists, the family of José Antonio was already gathered under a tent: Doña Elena, her sons, grandsons, great grandsons and Rosa, José Antonio’s wife, with their two sons of 3 and 8 years of age. 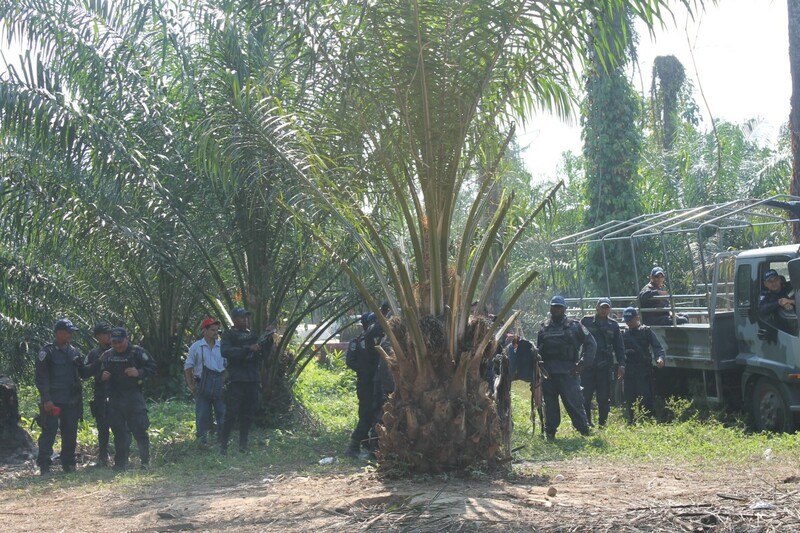 In addition to the family, the place was guarded by dozens of members of the police and the army. On one side, relatives and unarmed human rights defenders, looking for a spark of truth; on the other, armed men trained for war. The discovery site was marked by a sugar cane cross. Here, in the shadow of the palm tree, the exhumation process began. Leonel and Alma gave orders to the three campesinos who helped them in the excavation: they measured, marked, took photos, and filtered the dirt. We all followed them in silence, almost without breathing, in a surreal atmosphere. Little by little, the area was filling up with people. Dozens of campesinos had slowly approached until they surrounded the premises with a hug of solidarity and their banners protesting the militarization of the area and the repression of their struggle. And there they stayed, standing and quiet, all day. Around noon, the first signs of the body appeared: the rubber boots and the skull, resting on its right cheek, as if asleep. And then the striped bag and the fishing line that his wife had given him in the morning before he left the house, and the fish, buried with him. “It’s him!” one of his sisters exclaimed. “I knew it. It was a hunch. From the beginning I felt that it was him.” Doña Elena went to the grave and broke down in tears, covering her face with a white handkerchief. At 4 pm the compañeros rolled up their banners and left in silence, as they had arrived. After a powerful funeral ritual and the words of Pastor Rigoberto Ulloa and Priest Juan Colato, the bones were taken to a vehicle of the Office of the Prosecutor of Human Rights to bring them to the Public Prosecutor’s Medical Forensic unit in Tegucigalpa, where the forensic scientists would conduct a morphological analysis of the remains the following day. The certified laboratory of the FAFG would take care of the DNA tests for a complete identification. Without doubt, once it is officially and scientifically confirmed that the body recovered in the exhumation on April 25th is that of the disappeared José Antonio López Lara, the campesino movement of the Lower Aguán will obtain an important victory in their struggle to defend the land.